Rollover minutes? How about rollover miles? 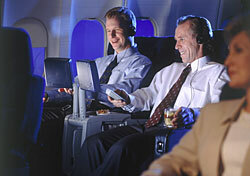 That’s the idea behind the key benefit of Delta’s newly announced 2010 elite program. With elite-qualifying rollover miles, any miles earned in excess of an elite threshold carry over to the following year. So, for example, a SkyMiles member earning 35,000 EQMs (elite-qualifying miles) during one year will be awarded Silver status for reaching 25,000 miles, and have 10,000 miles to apply toward reaching elite status the following year. In the past—and in other airlines’ elite programs—the mileage clock resets to zero at the beginning of every calendar year, rendering “excess” EQMs worthless. This is clever marketing on Delta’s part. And it’s mostly a win-win. Travelers get a head start on reaching elite status for the next year. And Delta gets more sustained loyalty—and increased revenue—as customers expand their earning horizon. But there’s always a downside to policies that swell the ranks of elite program members. The most coveted perk of elite status is upgrades, and the supply of first-class seats allocated to such upgrades is limited. So more elite members means more competition for those few available seats. Among the other new features of the program: a fourth elite tier, Diamond, earned for 125,000 EQMs or 140 qualifying flight segments. The perks associated with Diamond status include complimentary airport lounge membership, a 125-percent mileage bonus, and exemption from many bag and ticketing fees. As with rollover miles, the new tier has the effect, by design, of giving Delta customers a reason to be more loyal, and to remain so longer. Previously, once a SkyMiles member had reached Platinum, after logging 75,000 EQMs, there was no reason to remain loyal to Delta. Now there is. In addition to the above, Delta is waiving ticketing fees for Gold, Platinum, and Diamond members, and offering Platinum and Diamond members a choice of extra benefits including bonus miles, one-day lounge passes, systemwide upgrade certificates, and the ability to give elite status to a friend. Along with the news release outlining the new program benefits, Delta sent me a spreadsheet comparison of the elite benefits offered by American, Continental, Delta, and United. On paper, Delta’s elite program looks like a winner. But elite status is first and foremost about upgrades. And, as the fine print warns: “Complimentary upgrades are subject to availability and may not be available on all flights or in all markets.” In other words, upgrades are contingent—which is another way of saying they’re unpredictable. Which means that to upgrade the program, Delta will have to upgrade, well, upgrades.